The UPA government approaches the top court over the decision to cancel 122 2G spectrum licenses. 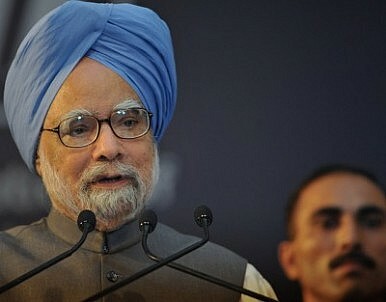 The United Progressive Alliance (UPA) government of Prime Minister Manmohan Singh has made an in-principle decision to approach the Supreme Court through a presidential reference on the court’s decision to cancel 122 2G spectrum licenses distributed in 2008 by then-Telecom Minister A. Raja. Singh is expected to chair a special meeting of the Union cabinet Saturday to fine tune the presidential reference, which will be the first since 2004, when the central government last used this rarely attempted route to resolve the Punjab-Haryana water-sharing row. The Constitution authorizes the president of the country to approach the Supreme Court on matters of great public importance. The Supreme Court treats presidential references as a top priority, and the chief justice normally sets up a five-judge bench to provide clarifications sought by the president. The UPA government is faced with a host of complicated questions, both legal and diplomatic, arising out of the Supreme Court’s verdict on the 2G scam, where 2G spectrum licenses were allegedly under sold at enormous cost to the exchequer. Countries like Russia and Norway have raised howls of protest to India through diplomatic channels, and Russian President Vladimir Putin is expected to raise the subject with Singh during the BRICS summit in New Delhi on March 28 to 29. The UPA’s decision to take the presidential reference route on the 2G issue underscored how serious the government is about going ahead. It has already moved a review petition before the Supreme Court, and argued that the court infringed on the executive in the 2G spectrum allocation issue.